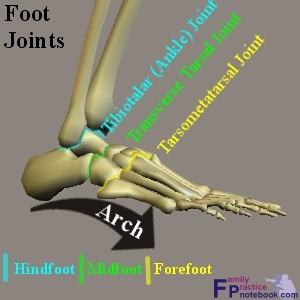 The navicular bone is located on the inside of the foot just above the arch. One in 10 people has an accessory navicular bone, which is an extra piece of bone attached to the navicular. Just like other bones, the accessory navicular bone grows and hardens in adolescence. People with an accessory navicular may experience pain and swelling from shoe pressure or from frequent sprains where the extra piece of bone attaches. An accessory navicular develops as a result of a congenital anomaly and is found more often in women. If the bone is large, it may rub against a shoe, causing pain. Because of its location, the posterior tibial tendon may pull on the bone during walking or running, causing the fibrous tissue that connects the accessory navicular to the navicular to tear and become inflamed. The catalyst for symptoms might be some sort of injury (such as a broken or sprained ankle), excessive activity, or irritation from where shoes are rubbing on the bony prominence the accessory navicular makes. These can irritate the bone, or make the tendon it?s embedded in (the posterior tibial tendon, remember?) inflamed and sore. Because the tendon is compromised in its ability to support the arch, accessory navicular syndrome almost always leads to flat feet, which is one very obvious symptom. Keep in mind there are two different types of accessory navicular bones, which you can distinguish by getting a weightbearing AP X-ray of the foot. Dwight has classified type I as a small, round and discreet accessory bone just proximal to the main navicular bone. Geist described the type II accessory bone, which is closely related to the body of the navicular but separated by an irregular plate of dense fibro-cartilage. Initial treatment is conservative. With the first episode of symptoms, a medial heel wedge, anti-inflammatories, and physical therapy can be helpful. If very painful, a cast or boot may be needed for a short period time before the wedge and physical therapy can be initiated. Very rarely is a steroid injection warranted or recommended. As the pain improves, patients can resume activities. For a minority of patients, an arch support or custom orthotic can help to take some of the extra pressure off of the accessory navicular and the posterior tibial tendon.